NuVu Studios, an innovation school for middle and high school students in Cambridge, Massachusetts, uses the studio environment for hands-on problem solving. NuVu Studios chooses their students based on their portfolios of work in computer science, engineering, music, and the arts. "We teach students how to navigate the messiness of the creative process, from inception to completion." The students work on creative, collaborative projects, with each project usually lasting about two weeks. They end up with a portfolio of their products and documentation of their design decisions. In a session on health and wellness, students Jesse Roberts, Max Steinberg, Leo Connelly, and Joey Raskin-Lantos wanted to make sports shoes easier to use. 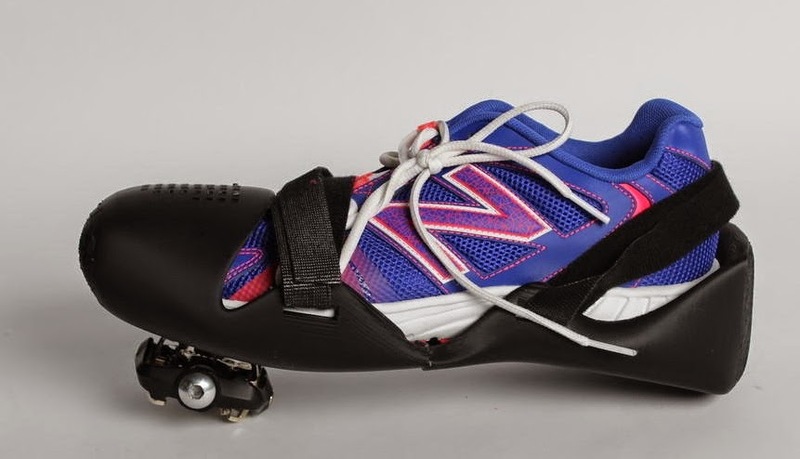 So they designed a bicycling cleat geared to the beginning triathlete. As part of the process, they learned Grasshopper and Rhino for 3D modeling and printing. The 3D-printed exoskeleton fits around a running shoe and straps onto the athlete's running shoe. The exoskeleton was designed to eliminate changing shoes between the bicycle and running legs of a triathlon.